Hampton@: Tell Congress To Audit The Federal Reserve - Sign Tea Party Petition Now! 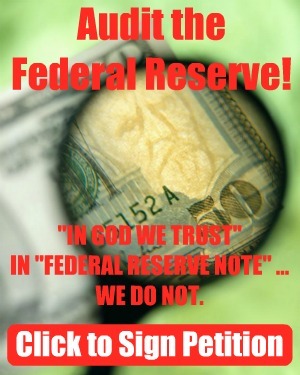 Tell Congress To Audit The Federal Reserve - Sign Tea Party Petition Now! The Tea Party was formed in large part to confront the culture of corruption in government. "We the People" were fed up with the trillions of dollars in taxpayer funds going to bail out corporations at a time when average Americans were losing their jobs. And while we've had tremendous success in changing the makeup of Congress, there's still one government organization that continues to spend trillions of dollars with little oversight: the Federal Reserve! The Fed can unilaterally enact U.S. monetary policy through trillions of dollars of "emergency lending," but they refuse to fully disclose information about it. This is the least democratic process in the United States. The only way we can be sure that the Federal Reserve is operating in the best interests of the American people--and not wealthy corporations--is to audit the Fed! That's why we're launching our "Audit the Federal Reserve" petition. The letters that we send to Congress through these petitions really make a difference, and this is one of the most important policy changes that we can help make happen! You can help by taking just a moment to use our petition system to contact your elected representatives and tell them it's time to shine sunlight on the actions of the Federal Reserve! The petition system is free, and while donations help us to continue to provide this service to all Americans, you do not need to make a contribution to participate. Let's make sure the Fed is acting in the best interests of the American public. Tell Congress to audit the Federal Reserve!